When I was working with my older brother back in the 80’s treated decks were all the rage. They quickly became so popular that we were tearing out perfectly good brick patios to build decks or just building over the patios. Housing contractors loved them because they maintained nearly the same value on a new home as traditional brick patios at a fraction of the cost. Back then building codes on decks were practically non existent, leaving a wide latitude in design and construction. Even though the treated lumber used to build decks was rated for 30 or 40 years people mostly did not consider them to be a permanent part of the house. Decks initially were not built on footings as they are today. If the soil was hard clay the support posts were often just set in the hole and filled in or half of a solid 4″ block was placed in the bottom of the post hole and the post was set on the block and back filled. On several occasions after we started pouring concrete footings around the deck posts we had clients express dismay at the thought of having to someday dig up all the posts when the deck was replaced. Over the years as more and more homes had decks built onto them a growing number of people wanted to, (and did), close them in or installed hot tubs on them, adding weight loads that the decks were never intended to carry. Also there were multiple instances of decks collapsing from being over crowded and no doubt inadequately built. This inevitably led to more and more stringent building codes. Personally I think it would have been better if the codes had just dictated that an addition could not be built on a deck. This would have kept deck costs much lower and would have also ensured a standardized model (i.e. brick,block or slab foundation) for room additions. Instead the building codes for decks evolved till now all decks must be constructed with the load bearing characteristics of a house. This is not really a bad thing. Every deck built to code now has the potential to be converted into indoor living space. The down side however is, . . . gone are the days when you could just build a simple inexpensive deck to grill on or sit and enjoy the day. Both labor and material expenses have increased significantly to satisfy modern code requirements. More recently, because of environmental concerns, the methods of treating lumber have changed along with the materials used in the treatment process. (See Hands on Deck for some insights on deck treatment processes.) The implementation of copper based wood treatments have necessitated the use of galvanized or vinyl flashing’s and precludes the use of all flashing made from aluminum which quickly corrodes when in contact with the copper infused wood. The type of fasteners used are also more critical with the new wood because of the same issues of excessive corrosion. Treated wood has always been broken into two categories, above grade and below grade. Tags stapled to the end of each board indicates the category of that board. The determining factor between above or below grade was the concentration of the treatment chemicals with the below grade having a higher percentage. That being said, the older, (arsenic treatment method), lumber that was rated for above grade use would still last 20 years or more when used in below grade applications. Not so with the newer above grade treated lumber which will start to decay in as little as three to five years if used below grade. Great care must now be taken to ensure that any lumber that is rated for above grade use does not come in contact with the ground. This is not an issue in areas where the deck is raised but ground level decks must be carefully planed and constructed to ensure that the soil does not touch the deck or deterioration may occur. The trees that modern lumber is milled from are generally much smaller than in decades past when old growth forests were more prevalent. Because of the smaller tree size and the speed with which modern lumber is brought to market the resulting lumber is less stable than the wood obtained from larger trees. This manifests mainly in two ways. The first is a greater tendency to twist and warp. This can be overcome by installing the material in a timely manner thus securing it before it has had time to twist or warp. The second stability problem is shrinkage especially in overall length. With no easy way to determine whether a particular board will shrink significantly the only option is to securely fasten each board and adopt a wait and see attitude. Shrinkage is generally only a problem with the thinner flooring boards so if a board shrinks enough to compromise the structural or visual integrity of the deck it is easy enough to replace. As the quality of wood and the preservation methods have changed, staining and sealing has become more critical. What was once considered an option has now become a necessary procedure to ensure the longevity of wood decks. 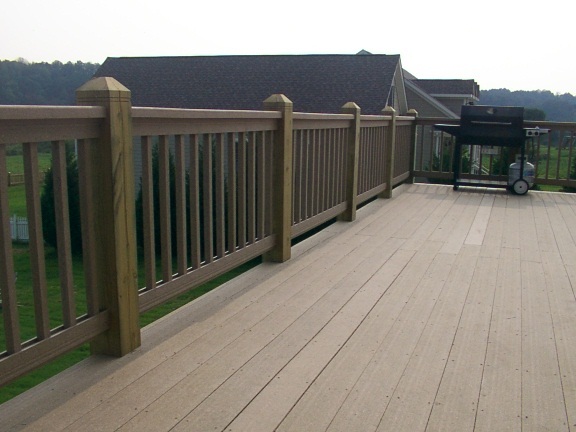 To avert stability concerns many decks are now being floored with composite or vinyl products. Although quite a bit more expensive, features like a very uniform appearance, optional hidden fasteners and the ability to create curved floors have expanded the design possibilities tremendously. 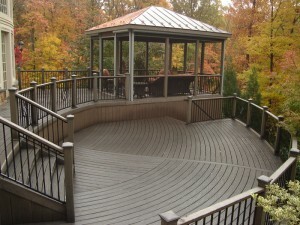 These flooring products combined with vinyl or composite railings contribute to some of the most visually appealing and maintenance free decks being built today. Wood’s Home Maintenance service can build a quality deck using your design or we can help you design a deck to suit your needs. We can also supply CAD drawings suitable for submission to the inspections dept. Let us get started on your project today! This entry was posted in Decks and tagged Decks, maintenance free decks, patios, Porch, treated lumber, vinyl or composite railings. Bookmark the permalink.